How Auctions Benefit Sellers Trying to Sell Land | Wilson Auction & Realty Co, Ltd. Selling land is often an expensive and time consuming process that is fraught with pitfalls. Selling at auction avoids much of the hassle while also offering some tangible benefits to sellers. These are a few ways that real estate auctions benefit sellers who are trying to sell land. Obviously sellers want to receive at least fair market value for their land, but it is even better if the seller can be assured that they will receive top dollar. The auction format promotes competition for the property that is being offered for sale, along with a sense of urgency, which encourages prospective buyers to offer top dollar. After all, there may be someone else at the auction who is willing to offer a higher price. 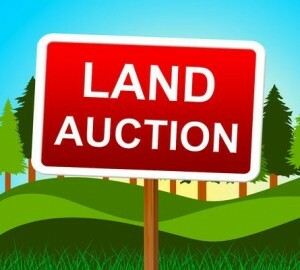 Selling land at auction provides sellers with a date when the sale will occur. This can be much nicer for sellers than wondering if a listed property may take months or longer to attract a buyer. The urgent format of real estate auctions also assures that buyers who are interested in a property must act on a certain date. Land auctions offer sellers the opportunity to work with the auction company to be sure that the property is marketed in the most effective way possible. The targeted marketing that is performed with a land auction is designed to reach prospective buyers and bring them to the sale ready to buy. Selling at auction also reduces the potential seller liability that is often associated with real estate transactions. Real estate auctions typically offer land “as is” and without contingencies. Since the sale terms are set in advance of the auction, there is less risk for the seller that a transaction will fall through after an offer has been accepted. Wilson Auction & Realty Co. brings more than 150 years of combined experience to real estate auctions. Our experience works to your benefit when you are ready to sell land. Contact us at 419-636-5500 to learn more about our real estate auction services.